UPDATE: 3view Freeview HD PVR to launch exclusively at John Lewis | What Hi-Fi? John Lewis will become the first high-street retailer of the 3view PVR when it begins selling the box on 30th July. Heavily delayed, the £299 3view box is a Freeview HD PVR with two tuners, allowing you to pause, rewind and record TV content. The 3view also connects to your Internet connection to allow access to BBC iPlayer, Sky Player, Internet TV services and apps such as Facebook. John Kempner, buyer for vision at John Lewis said: “This next generation set top box is an exciting new technology and once again John Lewis is first to market. Manufacturers like to use us as their launch partner because our customers are always early adopters of new technology." The long-awaited 3view Freeview HD personal video recorder (PVR) is now available for pre-order, with delivery scheduled for late May (it was originally due in March). You can order it for £299 on the 3view website. 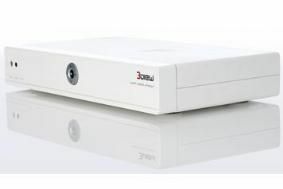 The 3view PVR can receive, pause and record standard- and high-definiton Freeview channels. It has two tuners, allowing you to watch one channel while recording another, or watch recorded content while recording something else. It's also internet-enabled and by hooking it up to a broadband router viewers will be able to watch Sky Player and YouTube, as well as access Facebook and Twitter through built-in widgets. The box is DLNA-enabled, has two USB ports and has a 500GB hard drive for recording. We hope to bring you a full review as soon as we get our hands on a finished production model.